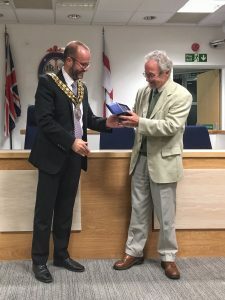 Alf Dove was a long serving councillor and the Award is given to a worthy recipient each year for services to the community. Dr Cole was until recently chair of the Basildon Natural History Society and the Langdon Living Landscape project. His work on species record keeping was instrumental in Natural England awarding SSSI status to the Langdon Ridge. Dr Cole in accepting the award spoke of those individuals who have supported his efforts for many years notably former Chair Gordon Reid and Conservation Officer Peter Furze. The event was attended by Dr Cole’s family, friends, and members of the BNHS committee as well as Basildon councillors.